Most firemaking lessons stop with the initial ignition. But that first flame won’t last long if you don’t have dry sticks to feed the fire. Here’s how to find them. It was dawn, the temps had plunged to 19 degrees during the night and we were on a Boy Scout Wilderness Survival merit badge outing. The graduation exercise was to spent the night in a shelter they had constructed, without a sleeping bag. Everybody was ready for a warm-up fire, which the scouts would have to build. Dry sticks can be found in wet situations if you plan ahead and look in the right places. wadded up the paper, lit it with a match and put a green pine bough, covered with frost, on top. Then they huddled around and waited to warm up. Results were predictable. This showed we needed to do a better job of teaching firemaking. The adults quickly built a warming fire and we did more instruction. Most people don’t have a clue on how to build a campfire under ideal conditions, let alone in a survival situation. While the initial ignition may be no problem, the next critical part will be finding dry twigs, sticks and wood to feed that blaze. But Murphy’s Law states that the more desperately you need a fire, the harder it will be to build one. Finding dry wood could be really, really hard, especially if it is raining. Here are some tips for finding dry wood in the rain. Locate the dry side of the tree: This seems elementary, but don’t try to find dry sticks on the side of the tree that is wet. If there have been prevailing winds, the dry side will be the area that is out of the wind. This becomes important, because outwardly, the wet side may look dry. The internal wood or bark, though may be dampish. This will be harder to light. Look for dry wood and tinder: Don’t wait until the last minute to gather your firemaking materials. 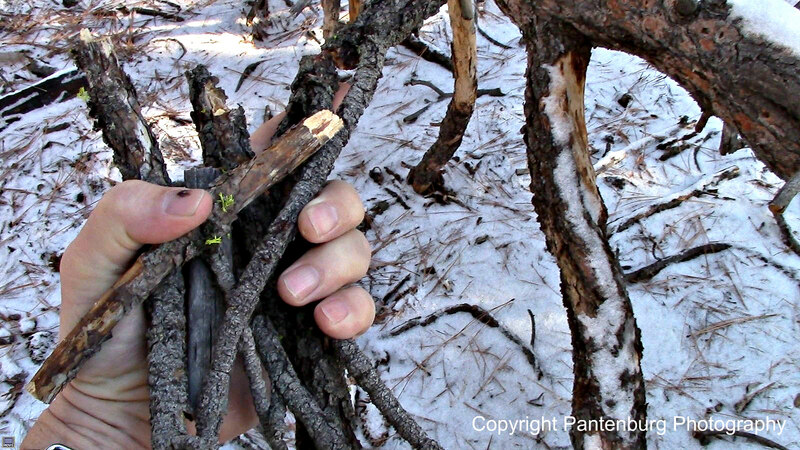 As you hike or pass through the forest, always be on the lookout for pitchwood, tinder, dried pine sap, birch bark or other natural firestarters. This may save you critical time later on. There is dry wood here, if you know where to look. Search for wood that isn’t on the ground: In the rain, the ground will get wet, and wood will absorb the moisture. Even when it dries out somewhat, wood on the ground can still be damp. Don’t be fooled by the dry outer appearance. 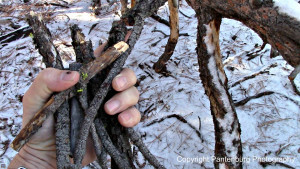 A dry twig will snap cleanly when broken. 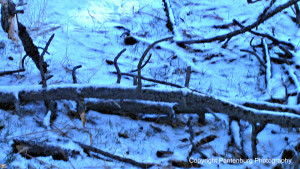 Keep looking until you find twigs that break crisply. Stack wood correctly: The survival books are full of suggestions for stacking firewood so the pile will burn. Tipi, log cabin or other styles will work just fine if you remember to use dry wood and leave spaces between the wood so the fire can breathe. 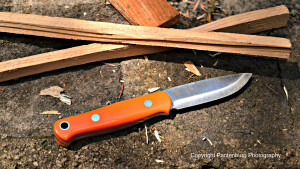 Always have a good knife along that can be used for processing firewood. Whittle: Always carry a knife (duh). You can whittle a dead, damp stick until you get to the dry inner wood. Then make a bunch of shaving and smaller pieces that will burn easily. 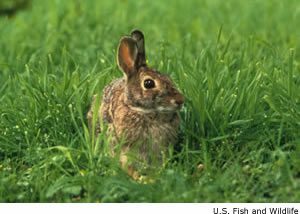 Don’t use anything green: Something that is green may also be dry. That doesn’t mean it will burn. Dry dead wood is what you’re looking for. Starting a fire in rainy circumstances is hard, not impossible. Like anything, a little pre-planning can make all the difference. Got the napalm tinder and I’m going to let a bunch of Boy Scouts try it out this weekend at a snow campout. The video has been doing very well on my YouTube channel – hope you’re selling a lot. I must have missed the invitation to the long range hunting course. Please send any info to lpantenburg@bendbroadband.com. Thanks! Morning, another tip to add is if your small wood, kindling is WET simply use your knife to remove the bark (which acts like a sponge for water) and you’ll have the dryer core of the twig/branch which burns much easier. I’ve done this quite a bit in our part of the world with good results. Its just another Indian trick to keep in mind. Did the Napalm Tinder containers arrive okay? Weeks back we invited you to our long range hunting course, is this something you are interested in? If so, choose a date and let our girls know. You do what it takes to survive. You mentioned pitchwood in “look for dry wood and tinder” which is great… Some pitchwood that appears wet on the surface will burn nicely, due to the high resin content, once the outer wet bark is removed. Feather and shave inner pitchwood to get it started. Gums up you blade but when you’re freezing who cares right? I feel fire making is a skill every child should learn. Most people don’t understand it don’t have to be cold to suffer hypothermia. It starts when your body temp. drops below 95*f. So learn 5 ways to start a fire and use these 5 tips and you will do well. And don’t forget, practice, practice, practice……. Survival expert Mors Kochanski considers firemaking to be the most important survival skill, and I agree. Keep practicing! Of course. It’s one of the first wood carving skills we teach kids. As one who still sometimes has an embarrassingly hard time getting a fire going, learning tip 3 was a big step forward. Of the “basic” skills, I still think reliable fire starting, without chemical tinders, is one of the more challenging. For me anyway.